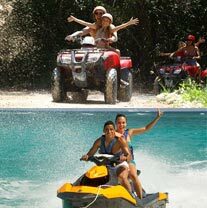 Riviera Maya ATV Tours and Excursions - Awesome! RENT AN ATV FOR A TOUR OF THE MAYAN RIVIERA! Put some horsepower into your Riviera Maya vacation with our ATV Tours! We have the biggest selection and best prices on ATV tours in the Riviera Maya, you can see them in the table below. 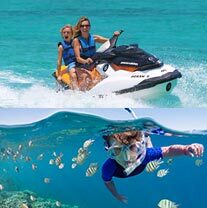 Ride through Mayan Jungle, along white sand beaches, to hidden caverns, adventure parks or coral reefs, or combine with exciting speedboat or jet ski tours - we have it all! Select your tour below. THE BIGGEST SELECTION AND BEST PRICES ON ATV TOURS! Q: Can I wait to book until I arrive in the Riviera Maya? A: ATV Tours have limited availability since there are only so many ATVs, and we offer many ATV Tours on our website that your hotel will not offer, at least for our prices. If you want to book a tour with us, you'll want to book before you go to Mexico so you can print out your vouchers and have it all set before you leave. Not only will this guarantee you a spot on the tour of your choice for a great price, but then you can spend your vacation actually vacationing instead of planning! Q: What is the minimum age to drive an ATV?